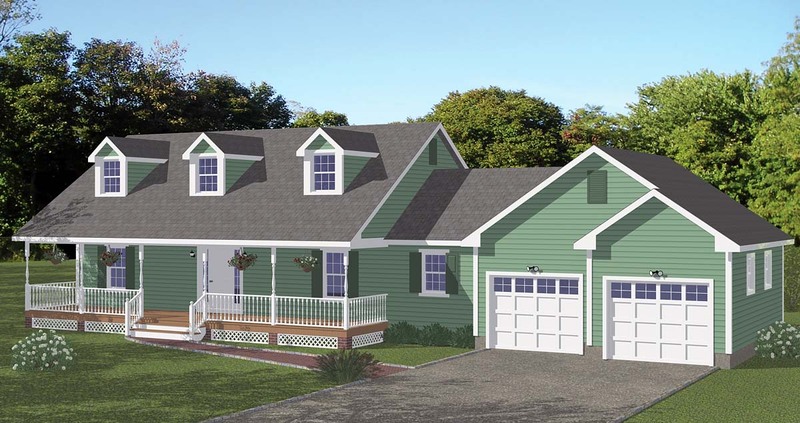 The multiple gables, doghouse dormers, and a gracious front porch give this lovely three -bedroom home a country feel. Covered Porch –Many evenings of relaxation is sure to be spent sitting in this charming space, featuring turned columns. Living Room - Step directly from the covered porch into this grandiose room. The open and airy feel of the room, along with its spaciousness adds to the ambience, it will surely be a space where all will congregate. Dining Room – Bright and airy, this room will certainly be used for everyday family meals, as well as, intimate dinner parties. With the space being open to the living room, the transition from pre-dinner conversation to the sit down meal, will be easy. Kitchen – This U-shaped kitchen with its plethora of cabinets and ample counter space is a cook’s dream. The moderately sized pantry provides even more storage space, making organization easy. Master Suite –Featuring a generous sized walk-in closet and private bath, this spacious master suite is sure to please. The private bath with dual vanities, oversized tub and separate shower will provide you with the comfort and privacy you seek. Secondary Bedrooms – Steps from a full sized hall bath are two generously sized secondary bedrooms. This home can be affordably built due to its simple and thoughtful design. The layout of the home ensures that it can be expanded quite easily, as the family grows. Question: Do these plans meet the 2009 IRC code? Answer: Yes, this plan is fully compliant with 2009 IRC. It is still the builder's responsibility to comply with all local codes and obtain all permits required by the local building department. Question: Are the plans stamped IRC 2009? Answer: The plans are all IRC compliant but there are no stamps on them excepy for a copyright stamp.